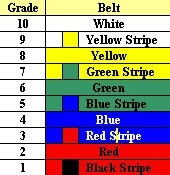 In Taekwon-Do the promotional scale is divided into nineteen ranks -10 grades (Gups) and 9 degrees (Dans). The former begins with 10th grade (Gup) being the lowest and ends at first grade. The degree begins with the 1st degree (Dan) and ends with the ultimate 9th degree. Taekwon-Do foundation is being laid. Green: Signifies the plant's growth as the Taekwon-Do skill begins to develop. tree as training in Taekwon-Do progresses. the opponent to stay away.